19th century French planter on stand with three caned sides with applied carving floral swags joined by a wreath on the front. The back has been newly upholstered in linen. Wonderfully carved legs and frame. The liner has signs of wear and losses from normal use. Repaired caning. Normal wear for age and use; back panel newly upholstered in linen. Pair of late 19th century English satinwood planters, hand-decorated with floral swags. Slight wear from use. 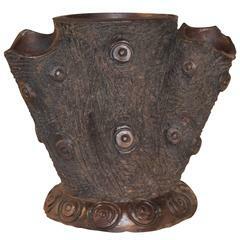 19th century French terracotta faux-bois strawberry pot. 19th century hand thrown pottery crock from France with hand applied handles.